The Gibson Dove appeared in 1962 as Gibson’s second square-shoulder dreadnought. 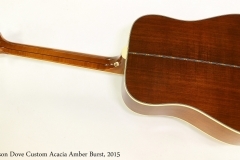 The Dove Custom Acacia adds Abalone binding and inlays, plus Acacia for the back and sides. 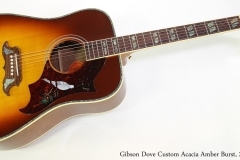 The Dove was Gibson’s second square-shoulder dreadnought, as they vied for market share with Martin’s D-series models. 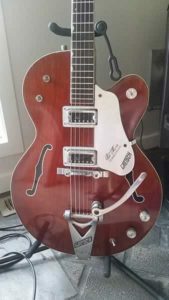 The first in 1960 was the Hummingbird, using Gibson’s formula of Spruce top, Mahogany back and sides, and 24.75 inch scale length. The Dove increased the scale length to 25.5 inch, and substituted Maple for the back and sides. These changes made the Dove brighter, crisper and louder than the Hummingbird. On both these models, as on on the iconic J-200, the pickguard is hand-painted. One person in the Gibson shop is tasked with painting each pickguard. The Dove also features dual-parallelogram inlays, a pair of doves inlaid on the bridge. On the Dove Custom Acacia, these are executed in Abalone. The top’s Multi-ply binding adds an Abalone layer. This example dates to 2015 and was built in scenic Bozeman, Montana. It is in good overall condition, with a fair amount of minor wear. Fretwear is light to medium, as usual heavier in the lower frets. It has very recently been set up in our shop and plays well, with a clear, well articulated tone. Acacia is native to many areas and there are over 1300 varieties, some of which grow as shrubs. Its use has a very long history, and is mentioned as the wood used for the Ark of the Covenant and all associated furniture, panels and poles of the Tabernacle. As a tonewood, varieties are include woods known as Hawaiian Koa or Australian Blackwood. “Since its introduction in 1962, the Dove has gained a reputation as the guitar for players looking for a bold, unique look with great rhythm capabilities and tonal qualities. Designed for supporting vocals, the Dove has a smooth sound that compliments the voice.